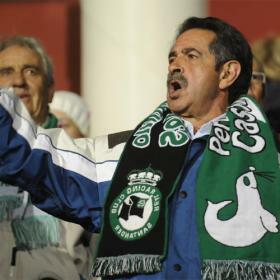 El Gobierno de Cantabria asistirá este viernes en Zúrich (Suiza) a una reunión con Ahsan Alí Syed para intentar cerrar la venta del Racing de Santander, aunque su presidente, Miguel Ángel Revilla, reconoce que aún mantiene recelos sobre la operación y las garantías de futuro que ofrece el empresario indio. “Mis acciones yo no se las voy a vender, por si acaso”, ha asegurado hoy Revilla, que compró participaciones del Racing por valor de 3.000 euros en las últimas emisiones abiertas a inversiones minoritarios. Revilla se ha mostrado cauto sobre el cierre la operación, por los retrasos que se han ido acumulando en las últimas semanas y por las informaciones que se han publicado sobre Alí Syed, que el año pasado también intentó hacerse con el Blackburn Rovers, pero el club inglés rechazó su propuesta. “Yo no las tengo todas conmigo, porque en los últimos días he oído de todo. El indio no acaba de llegar y hasta que yo no le eche el ojo encima y podamos verle la cara y, sobre todo, los avales…”, ha apuntado el presidente cántabro, antes de precisar que parece que la operación está ya en su última fase. Yo tampoco me fio de los indios sobre todo americanos que son los que inventaron eso de fumar. Revilla con tal de salir en los medios hace lo que sea… con el dinero de otros. Y ahora ha encontrado otra ocasión. 3.000 eurazos tiene invertidos, 3.000 eurazos en un equipo de primera división, la mejor liga del mundo y quiere mandar o que su opinión se oiga ¿? que pojnga más dinero. clica sobre mi nombre. Menudo fantoche. Contento tenía que estar de que alguien se interese por el club. Pero que los que estaban, no creo que lo haga. ¡¡¡ Qué listo éste Revilla !!! Yo opino lo mismo que él. No me fío ná de ná de éste tipo, ó lo que tenga detrás de él. Este retraso desde que se anunció la operación no me huele nada bien. No tengo nada en contra pero si lo compra un indio es para crear una peña antiracing. Cuando pienso que tienen armamento nuclear con lo inútiles que son se me ponen los pelos de punta. NOSOTROS POR LO MENOS ESTAMOS EN PRIMERA. ¿Cierran el acuerdo en Suiza? Por qué será… ¿evasión fiscal tal vez? Took me time to read all the comments, but I definitely enjoyed the article. It proved to be Pretty helpful to me and I’m certain to all the commenters right here It is always nice when you can not only be informed, but also entertained I’m positive you had fun writing this article. Good to become going to your blog again, it continues to be months for me. Properly this post that i’ve been waited for so long. I need this article to total my assignment in the university, and it has same subject together with your article. Thanks, great share. Just a fast hello and also to thank you for discussing your ideas on this web page. I wound up inside your blog right after researching physical fitness connected issues on Yahoo… guess I lost track of what I had been performing! Anyway I’ll be back as soon as once more within the long term to test out your blogposts down the road. Thanks! Resources these as the 1 you mentioned here will be extremely useful to myself! I’ll publish a hyperlink to this web page on my particular weblog. I’m positive my site guests will locate that fairly advantageous. Congratulations on having one of the most sophisticated blogs Ive arrive across in some time! Its just incredible how much you can take away from a thing simply because of how visually beautiful it’s. Youve put together a great blog space –great graphics, videos, layout. This is definitely a must-see blog! Hey – good weblog, just looking around some blogs, appears a pretty great platform you are using. I’m currently using WordPress for a couple of of my websites but looking to change 1 of them above to a platform comparable to yours as a trial run. Anything in specific you would recommend about it? SERA EL RACING EL NUEVO CHELSEA? Good job here. I genuinely enjoyed what you had to say. Keep going because you absolutely bring a new voice to this topic. Not many people would say what youve said and still make it interesting. Properly, at least Im interested. Cant wait to see extra of this from you. Dude, please tell me that youre heading to publish far more. I notice you havent written an additional blog for a while (Im just catching up myself). Your blog is just as well important to be missed. Youve got so substantially to say, such knowledge about this topic it would be a shame to see this weblog disappear. The internet needs you, man! I think youve created some genuinely interesting points. Not too many people would actually think about this the way you just did. Im truly impressed that theres so very much about this subject thats been uncovered and you did it so nicely, with so substantially class. Good one you, man! Actually good stuff here. Hey – good blog, just looking around some blogs, seems a fairly great platform you might be making use of. I’m presently using WordPress for several of my sites but looking to alter one of them through to a platform comparable to yours like a trial run. Anything in particular you would suggest about it? Hey – good weblog, just looking about some blogs, appears a quite great platform you are utilizing. I’m presently utilizing WordPress for several of my websites but looking to alter one of them more than to a platform comparable to yours as being a trial run. Something in specific you would recommend about it? Dude, please tell me that youre going to publish much more. I notice you havent written another weblog for a while (Im just catching up myself). Your weblog is just also important to become missed. Youve obtained so considerably to say, such knowledge about this topic it would be a shame to see this weblog disappear. The internet needs you, man! What I wouldnt give to have a debate with you about this. You just say so many things that come from nowhere that Im fairly positive Id have a fair shot. Your weblog is wonderful visually, I mean people wont be bored. But others who can see past the videos and the layout wont be so impressed together with your generic understanding of this subject. Youre so right. Im there with you. Your blog is certainly worth a read if anyone comes throughout it. Im lucky I did because now Ive received a whole new view of this. I didnt realise that this issue was so important and so universal. You surely put it in perspective for me. I must say, as considerably as I enjoyed reading what you had to say, I couldnt help but lose interest after a while. Its as if you had a terrific grasp around the topic matter, but you forgot to include your readers. Perhaps you should think about this from extra than 1 angle. Or maybe you shouldnt generalise so considerably. Its better if you think about what others may have to say instead of just going for a gut reaction to the subject. Think about adjusting your personal thought process and giving others who may read this the benefit of the doubt. I think youve created some really interesting points. Not also many people would in fact think about this the way you just did. Im really impressed that theres so considerably about this topic thats been uncovered and you did it so properly, with so very much class. Beneficial 1 you, man! Definitely great things right here. What I wouldnt give to have a debate with you about this. You just say so many things that arrive from nowhere that Im fairly sure Id have a fair shot. Your weblog is wonderful visually, I mean people wont be bored. But others who can see past the videos and the layout wont be so impressed together with your generic understanding of this subject.